Posted in Outdoor Activities, Photos & Videos, What to Do? 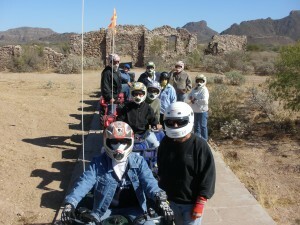 When it’s too cold to go in the water, ATVing in the Sonoran desert is a great alternative. Last week, a group of us rented quads from Off the Edge and were thrilled with our four-wheeling adventure. Led by Erick, an experienced bilingual guide with a great sense of humor and a passion for fun, we first headed out along the scenic highway towards the palm trees on the left just past San Carlos Plaza hotel, and then went through the desert by the Catch 22 ruins, a movie filmed here and released in 1970. Next we headed towards a waterfall canyon where we enjoyed some refreshments and a short hike to learn about the area. Erick is chock-full of interesting information about the desert’s history, flora and fauna, and was happy to share it with us. We then moved on to beautiful Cactus Island and its white sandy beach. From there, we headed along the coastline and beach in La Manga and had a blast on their sand dunes. Flying over these was the highlight for me. The three-hour adventure tour ended back at Off the Edge / Tortugas, where we all enjoyed a cold beer and I had their delicious crazy potato with chili. What a great way to spend the day! ATV Tour with Off the Edge through the desert, up arroyos, past an old movie (Catch 22), to an ojo in the mountains, along the beach and over sand dunes.